An East Durham College student has become a champion kickboxer in just his second fight in the sport. 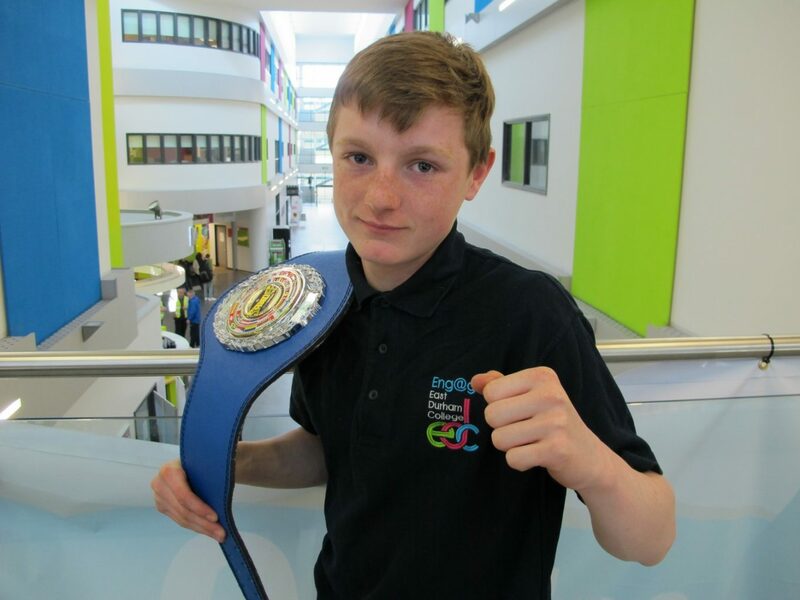 East Durham College student, Rhys Smith, 15, from Peterlee, has won the World Traditional Kickboxing Association Intercontinental Junior Muay Thai Boxing Championship at 51kg weight. The WTKA Intercontinental Junior Championships took place at Sheffield’s Ponds Forge International Sports Centre on Saturday 23rd April. This was a great achievement for Rhys, who has only been training in the sport for 18 months, with the event being his first experience of competitive fights. Rhys, who studies on the college’s 14-16 Engage course, has a great dedication to the sport, training four days a week at Durham’s Unity Gym. Rhys was extremely proud of his achievement and is looking forward to more fights in the future. Rhys said: “These were my first real fights outside of the gym and I certainly wasn’t expecting to come away with the title. “But once I got through my semi-final I knew there was a chance that I could go on and win the final.